This is about to be the worst review ever, because I’m going to start by stating that I did not actually try this tea. I hate coffee (I know, I know…). I really cannot stand the smell of coffee on a good day. Up until maybe 4 years ago, the smell of coffee made me sick to my stomach. Jumpy Monkey has a bitter coffee smell to it, I don’t really smell any of the chocolate that is supposed to be in there (I also don’t see it at all). With all the coffee that’s supposed to be in it, this is not an infusion of any sort that I want to try, but I am posting about it because it is part of the 24 Days of Tea. 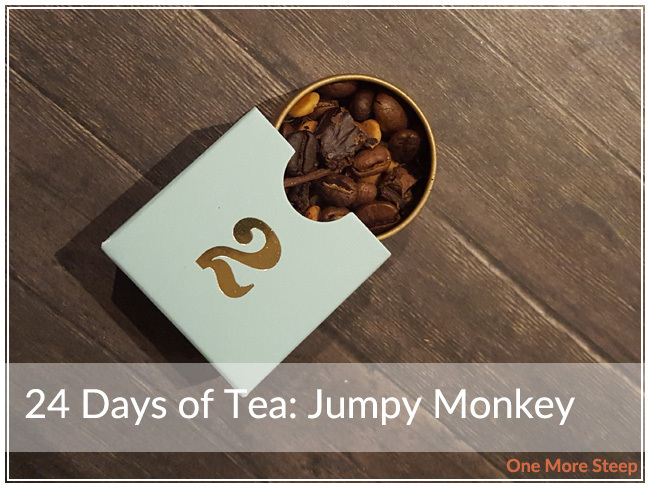 The ingredients of Jumpy Monkey are: roasted yerba mate, green yerba mate, white chocolate, carob, baba budan coffee, green peaberry coffee, Brazil green coffee, Kenya green coffee, chicory, olive leaf, almonds, artificial vanilla flavouring. I did not try DavidsTea’s Jumpy Monkey, so I can’t give it a proper rating. I’m just really not a coffee fan at all, and the idea of drinking something that may make me feel sick to my stomach is not why I started One More Steep. If you’ve tried Jumpy Monkey before, let me know below in the comments how you feel about it! Is it something that a coffee hater might actually like, if given the chance? It was really delicious and those white/cream colored pellets are the white chocolate.